"Linger awhile" at Skipper's Restaurant. 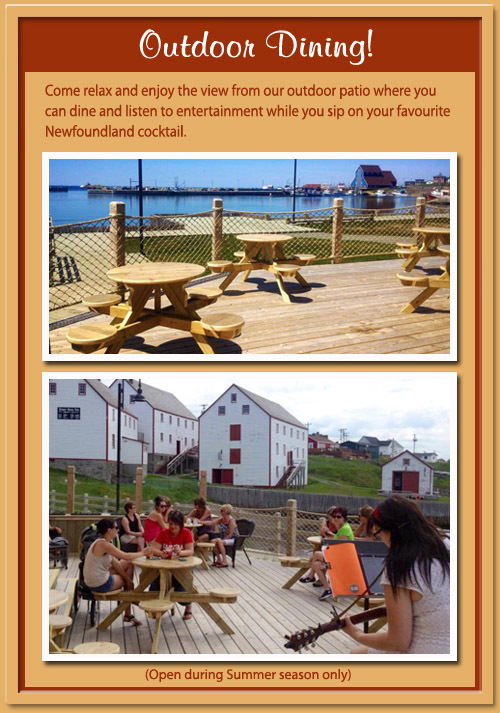 Located onsite at The Harbour Quarters Inn, this fully licensed restaurant offers breathtaking views of Bonavista's Harbour. Dine inside,or relax on our outdoor patio and watch fishermen sail in the harbour with their catch of the day, see icebergs glisten under the summer sun, smell the fresh, salty air. Skipper’s Restaurant is a family restaurant serving traditional Newfoundland cuisine, homemade desserts baked on site and a variety of selections from the grill and deli. You’ll be sure to please your taste buds - whatever the choice!